You have worked hard to recover your finds, the last thing you want to do is to throw them in a drawer and leave them to corrode to dust, for if you don’t take a few basic precautions that is what could happen. I know the problem; I searched high and low for simple practical information on cleaning and conserving coins and relics only to be told to take them to a conservator. That’s great advice if the find is rare, valuable or historically important but most dug metal objects are not worth the cost of employing an expert. Now you don’t have to! This book shows you how you can quickly and easily learn simple, low cost techniques to turn your dirty old coins and artefacts into stable and great-looking art works you can proudly display and so much more…You will become the expert! Managing coins and artifacts starts as soon as you get a metal detector signal, so here’s how to dig up your find without damage and get it safely home. A very easy way of safely preserving your coins and artefacts forever. You need to know what your find is and if it is valuable before you undertake any cleaning. You will learn how to identify and value your coins and artifacts and distinguish Aluminum, brass, bronze, copper, cupronickel, gold, iron, lead, nickel, pewter, platinum, silver, steel, tin, zinc and other metals. Health and safety advice you need to know before cleaning coins and artefacts at home. Everything you need to know about mechanical cleaning from simple hand tools to oscillating engravers, ultrasonic cleaners and barrelling machines. The black arts of the electrolysis kit clearly explained. 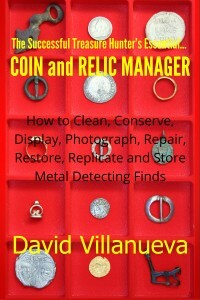 Tried and tested solutions for cleaning, finishing, conserving and preserving just about all metal detecting finds, from ancient coins to modern relics. Not just your own coins and artefacts either, some people buy uncleaned Roman coins for pennies and using the information in this book, clean them up and sell them for pounds or dollars. To enhance your damaged coins and artifacts here’s how to join, repair, reshape and restore in short order. And you can keep your finds, while sharing them or selling them, at the same time, by making replicas. You won’t believe how easy metal casting is until you read this chapter. 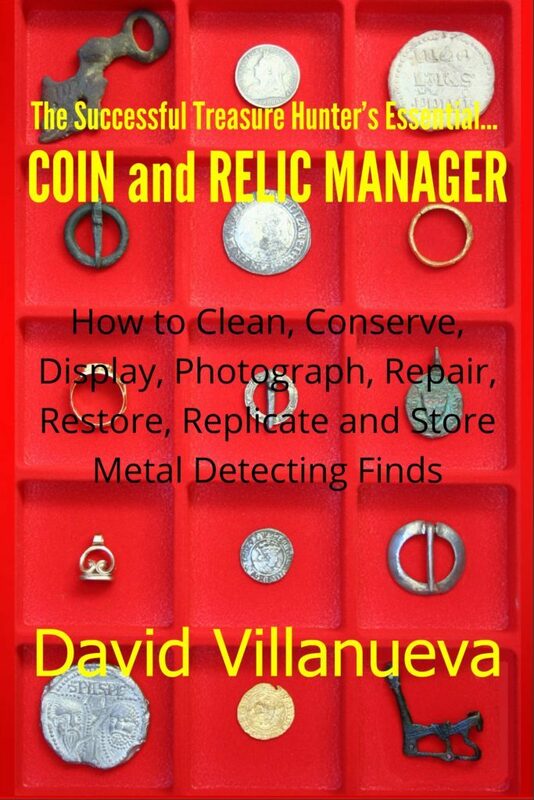 Close-up photography of small metal objects is difficult to master…unless you have The Coin and Relic Manager to guide you every step of the way. As well as raising top dollar on auction sites if you sell your coins and relics, you can profit by selling the photographs to treasure hunting magazines. Everything you need to know about storing and displaying coins and artefacts is here. And you won’t believe how simple it is to make great low-cost vertical displays for your own pleasure or as a gift that really keeps landowners happy. Avoid losing rewards through cleaning treasure. Where to get products and supplies. Corrosion waits for no one, so don’t delay, get your copy of The Successful Treasure Hunter’s Essential Coin and Relic Manager today. The book your finds would want you to have and some great opportunities for profit too!